Trigger points, also known as trigger sites or muscle knots, are described as hyperirritable spots in skeletal muscle that are associated with palpablenodules in taut bands of muscle fibers. 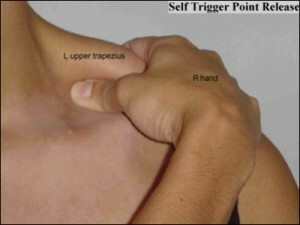 Compression of a trigger point may elicit local tenderness, referred pain, or local twitch response. The local twitch response is not the same as a muscle spasm. This is because a muscle spasm refers to the entire muscle contracting whereas the local twitch response also refers to the entire muscle but only involves a small twitch, no contraction. Release of Trigger points are the principal cause of pain in the back, neck, shoulder and limbs. And many other conditions not listed above.